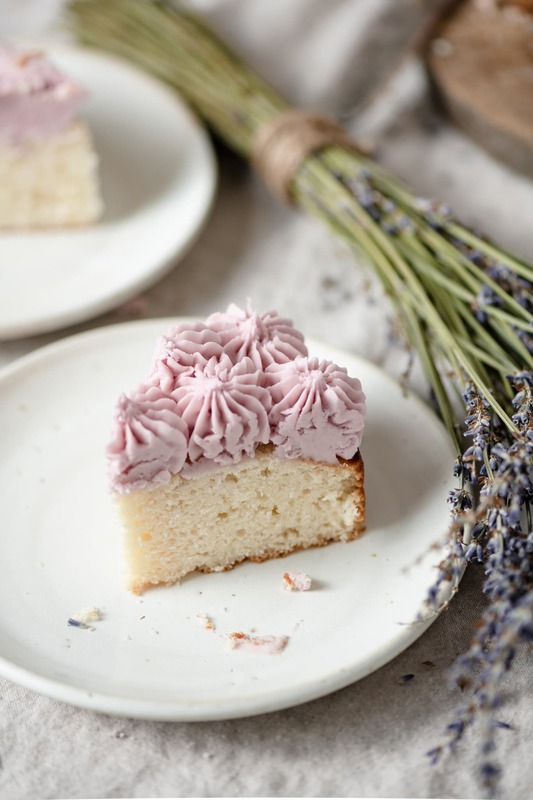 Its not Spring without cake and Lavender Buttercream with fresh lavender. 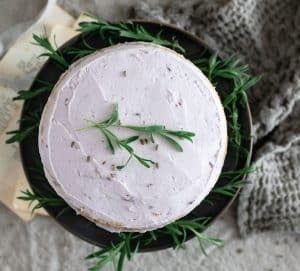 Lightly floral flavored frosting using dried culinary lavender and fresh blueberry juice for natural coloring. Use for topping your cupcakes, layered cakes, or cookies for a tasty soft pinkish purple colored dessert. Lavender is a strong herb that should be used sparingly to prevent overtaking a recipe. Its far more enjoyable as a background taste than eating an overly floral infused dessert. This is why I only use a small amount mixed with vanilla extract. The flavor potency of lavender increases as it dries. Which means a recipe should use 1/3 dried flowers in comparison to fresh. 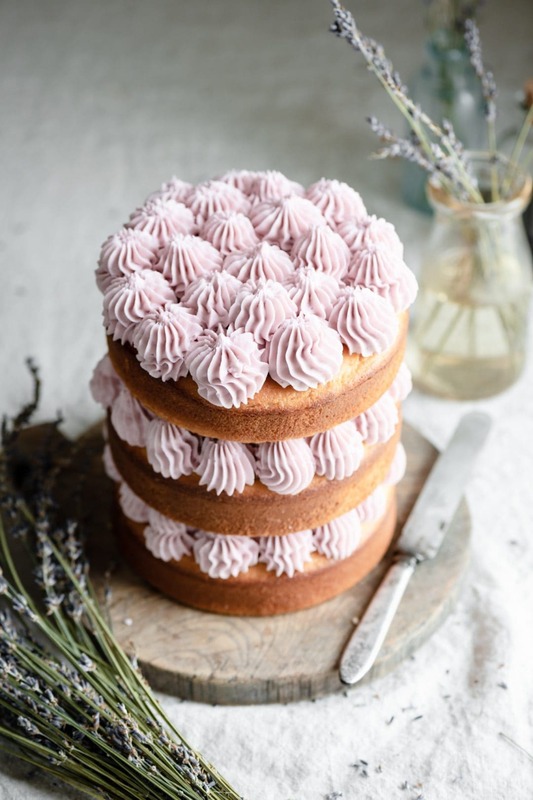 In this recipe I have used 2 teaspoons of dried lavender for a large amount of buttercream to cover my cake. If I were to substitute with fresh lavender flowers I would use 6 teaspoons. What is the difference between English and French Lavender? English Lavender (L. Angustifolia) is the sweetest of all lavender species, and is most commonly used for baking. Some varieties even give off a hint of lemon. French lavender has a scent of camphor and menthol, which is more medicinal flavor. It is also known to be toxic in very large quantities. 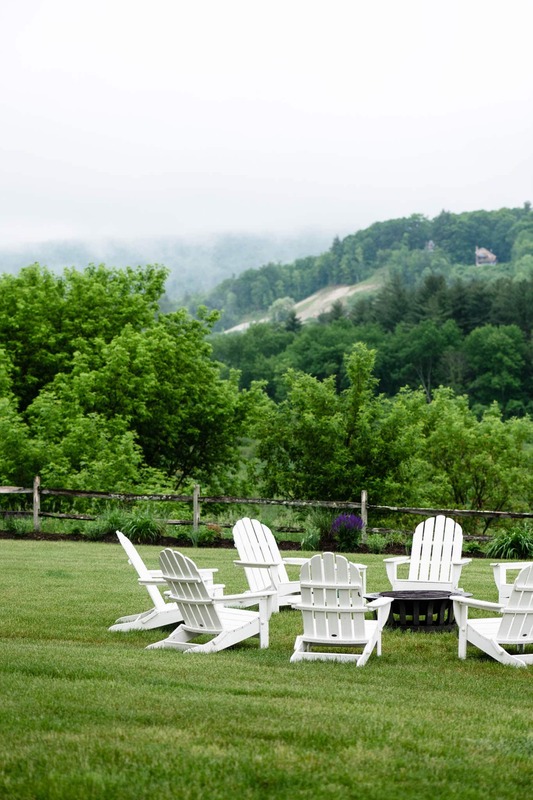 So, its best to just enjoy the beautiful flowers as they bloom in your garden or use for decorations. Culinary lavender is often known as dried flower petals/buds taken off a stem just after opening (stems as well). 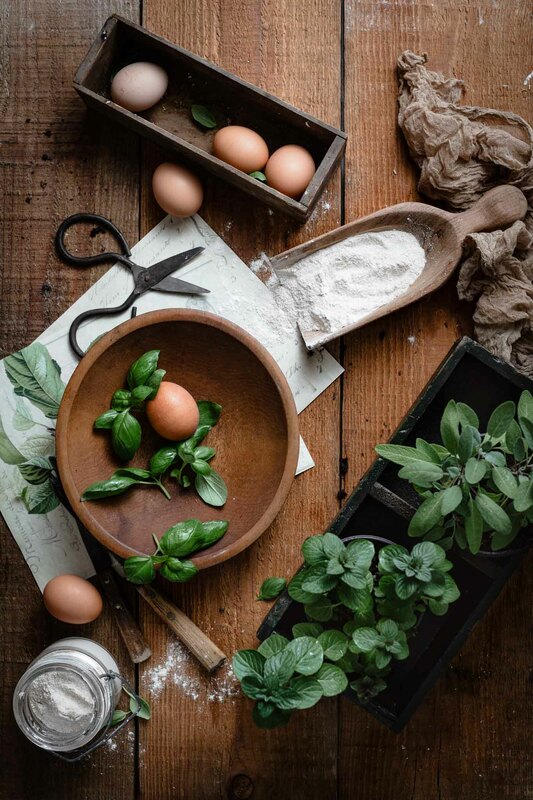 However, the flowers and leaves can also be used fresh. Lavandula Angustifolia is the most common species of lavender for baking. Add 1/8 cup blueberries and 2 Tbsp water into a small sauce pan. Heat on medium for 5-6 minutes, stirring and gently mashing the berries. Once the juices are pouring out into the saucepan remove from heat ands set aside. Strain berries through a sieve into a small bowl. Discard berry solids. Repeat with 1/8 cup blackberries using a clean saucepan and separate final bowl. Add small amount of the blueish blueberry juice and the pinkish red blackberry juice to your finished buttercream. Adding more blue will create a deeper purple. So, just play around until you find the shade you like! 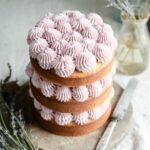 You will have a blueberry lavender buttercream cake frosting that can also be used to fill macarons or cookie sandwiches!! Another way to get a deeper purple Lavender Buttercream is to use juice from a purple potato! Slice and boil two purple potatoes, using the juice to dye the frosting. 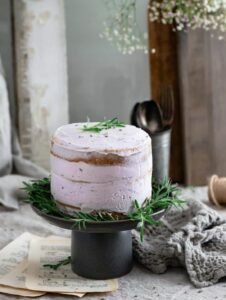 Homemade Lavender Buttercream cake frosting made with culinary lavender, vanilla, and blueberry juice. In a food processor combine the 2 Tbsp of Granulated Sugar with the 2 tsp of dried Lavender buds. Pulse until a fine powder is formed. Set aside. Place softened butter and vanilla in bowl of stand mixer. With whisk attachment, beat the butter until light and fluffy. Add 1 Tbsp of blueberry juice and the lavender sugar mixture. Add Powdered Sugar a half cup at a time while whipping at medium speed. Continue to add powdered sugar. Pour small amounts of berry juice mixing slowly to create the desired shade of purple. Buttercream should be thick yet easy to spread. If its to thin add more powdered sugar. Too thick, add more berry juice! 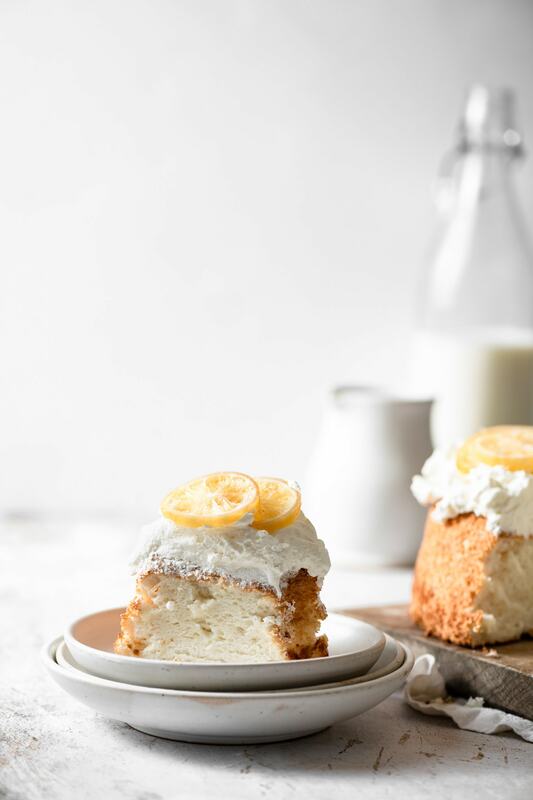 Can you provide a link to the cake recipe? Thank you! It will posted in a couple days!! yay!